Peel Thunder’s finals hopes suffered a blow on Saturday at HBF Arena, after West Perth blind-sighted Peel in fourth quarter to win by 31-points. Peel lead for the majority of the game before a seven goal final quarter surge saw the Falcons win 16.11. (107) to 11.10.(76). The Thunder’s Traye Bennell said they played a good game despite the loss. “We played a good three quarters and in the last one we died off,” he said. Peel started the opening term strong, with the first goal of the game through Harley Bennell. Peel’s momentum continued in the second quarter as they increased their lead to 10-points. After half time the Falcons fought hard to tighten the gap to only four points by three quarter time, before a big final quarter surge saw them earn the win. Despite Peel’s final quarter fadeout, Bennell said their defence fought hard. “I thought our defence was pretty good all day, but I think we just died off in the end,” he said. Bennell said Brady Grey (25 disposals and a goal) played a good game, alongside Danyle Pearce (34 disposals and a goal), and Matthew Taberner (three goals). “Brady Grey was pretty good, Danyle Pearce as well… Taberner had his first game back from injury and was good up in forward,” he said. With only three games left before finals, Bennell said the Thunder will have to give it their all to keep the dream of finals alive. “We just have to keep working week in and week out, bring on each week and take one game at a time,” he said. 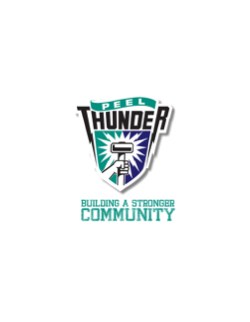 Peel Thunder will play East Perth on Saturday, August 4 at Bendigo Bank Stadium. Bounce dwn at 2:15 pm.